Libra — simple and at the same time complex child. He is suspicious, vulnerable and tender. He lacks determination even in small domestic situations. However, to look after it in infancy is quite easy. He is unpretentious, rarely crying and capricious. Buy a Libra child only beautiful toys, because, like the adult representatives of this sign, he has a strong attraction to the beautiful. His room should be furnished aesthetically and tastefully. The children of this sign need a warm family atmosphere, a cozy house where you can hide from all hardships and relax peacefully. Quality sleep is needed by Libra more than other signs. These children are not so hardy, quickly get tired, but rarely complain and demand to themselves attention. They are happy to communicate with peers and adults, like when the house guests. Sometimes Libra’s kids are difficult to understand, they are constantly painfully looking for harmony and balance of life. She is sweet, fragile and graceful girl. Loves flowers and animals. Wear a daughter, observing a combination of styles and shades, make her beautiful hairstyles. Libra girls have poor health, they need parental care more than independent children of strong signs. The Libra girl wants to be perfect. She will not fight, climb trees and ride a bicycle on a par with boys. She’s a little aristocrat. Libra-girls can watch beautiful for hours, they like fairy tales about princesses and wizards. These babes are touched by the sunset and the quiet waters of the river. The Libra girl likes to prank dolls, sew them fashionable dresses. Teenage Libra are extraordinarily feminine and attractive, although sometimes they can amaze with their bold behavior and display male character traits. Boys of this sign always have something from girls. Their voice is quiet and melodic, the behavior is calm. These children are interested in designers, and later books. Almost all Libra have musical talent, that’s why from the age of three they easily learn music and dancing. The Libra boy is polite and tidy, not afraid to speak with adults first. His character combines softness, poise and compliance. The boys of this sign have significant disadvantages. First, it’s laziness. Libra do not have enthusiasm and determination, they must always be sent to someone more enterprising. Secondly, Libra is rather indecisive, they always doubt. Often measured seven times, and not one will be cut off. The boy of this sign needs to be taught the true masculine qualities, to teach him to be more firm and resolute. Children of this constellation rarely worry their parents with hysterics and whims. But do not think that Libra can not be offended. They take a long time to hurt the insult in the depths of their hearts, and one day it can break free. Libra has a good intuition, they like to talk heart-to-heart, help people with their problems. However, their sympathy is often superficial. Adults Libra — are incorruptible judges, and small representatives of this sign only learn to judge people, weigh their actions on the scales of good and evil. Many Libra have a superficial and frivolous attitude to life since childhood. If you do not accustom them to responsibility and independence, they can grow up to be lazy dependents. Libra likes to talk and argue, but often it’s just talk. Their heads are full of ideas, but to put them into practice Libra lacks courage. Libra are able to flatter and cunning, which helps them to manipulate their parents. But they are not flattery themselves and quickly recognize lies. Practicality, this sign does not differ. Pocket money, they can squander on lovely trinkets and at the same time stay hungry. It seems that Libra is fed only by air and beauty. They have an early interest in painting and poetry. Libra worldview and refined. Sometimes it seems that they are not of this world. They do not care about everyday problems, they are hovering in the clouds. In their teens, the spirit of romanticism awakens. Libra is amorous, but usually their feelings are shallow. People of this sign are very hypochondriac and if they become ill, they wind themselves up and even from a mild indisposition make a whole tragedy. Stresses are their main enemy. Perhaps their excitement about their health is not in vain, and it is worth paying attention to any trifle, because it can develop into a more serious pathology. Libra instinctively protects forces, take breaks to rest. They need to constantly replenish energy, which is weak from nature. Vulnerabilities of the Libra are the kidney and bladder. Girls of this sign often have problems with gynecology. The thyroid gland also requires special attention. Throughout life, Libra is concerned about hormonal disorders that begin as early as childhood. Because of the addiction to sweets, Libra has a risk of developing diabetes. From an early age, these children need to be taught to eat a healthy balanced diet, the right regime of the day. This is a creative sign, so choose your art classes for your child. 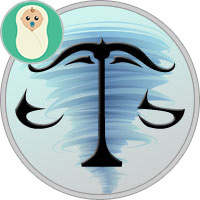 Another suitable sphere for Libra is jurisprudence. Talent to persuade will help him become a good lawyer. Many children of this sign are early addicted to psychology. They are excellent analysts, and this can be useful if your child decides to become a cultural scientist or literary critic. Libra like to teach others, but real teachers rarely come out of them. They do not know how to apply rigor and strength, which is often necessary. If Libra does something, they do it primarily for the soul, and not to achieve something or sharpen the skill. For them, the process of work is important, not its result. Sometimes it is laziness or a breakdown that prevents them from completing the business they started. It is necessary to encourage the creative interests of the child, develop his talents, teach setting goals and achieve them. At school, Libra manifests itself as conscientious students, their behavior is always decent. Teachers often put them as an example to classmates. Exact sciences are given to them more difficult, but their innate subtle mind is able to master any discipline. However, their knowledge is not too deep. Libra studies only because it requires debt. Such students should be directed and encouraged, otherwise discouragement and indecision will do their job — Libra will grow lazy, not having a specific idea of what they want from life. Libra are good performers, sometimes quite good organizers. But they do an excellent job with only small tasks. Cumbersome projects scare them. If a Libra-schoolboy, for example, decided to seriously engage in vocals and become a singer, he is necessarily a necessary good tutor or producer. Libra is very difficult to get into people, relying only on their own strength. Behind them is a strong patron. Develop in the child determination and strength of the will, so that he does not suffer until the end of his life, buying a scarf or choosing what to wear in the morning. In search of harmony, Libra can become entangled in itself. Help them to know their own self and find their own way of life. Without a loved cause, their life will be empty and meaningless. Their relationship with people will be unstable, if not to accustom Libra to responsibility and the ability to compromise. When choosing friends, such children either succumb to their influence, or weigh them too long and as a result remain alone. It is necessary to supervise, that the child has not got in the bad company. The search for the meaning of life and a suitable environment often leads Libra into dubious youth associations. Libra is not very religious, but teenagers of this sign can get carried away with esoteric and spiritual practices. Take care that your child does not find himself in a certain sect. Libra can become philosophers, if their life has failed. If they had a happy childhood, they will most likely choose a creative profession and will be able to open up to it as much as possible. You can not shout at the children, Libra, their soul is so fragile and delicate. Teach them to weigh the possible options for action calmly, without drama. Let the child learn to analyze everything and painlessly discard the excess. Develop in it independence, do not support the status of my mother’s son (daughter). Teach your child practicality and punctuality. Take care of its financial literacy. Teach Libra to say no and calmly perceive the changes in life.